Dennis has been a member for about 4 years. He has a sedan and a customized Corvan, which he bought in '74 as a van. 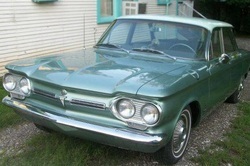 He's owned about 3 other Corvairs, but the green sedan is his most recent acquisition. He says it's currently on the operating table for low compression in the # 5 cylinder. And he says, "Like most car folks, I have a few tales of woe, wonder and other lies to be shared without invitation, so long as the inevitably dwindling powers of cerebration will allow. "